I should be working (in fact, there are a lot of things I should be doing) but what I want to do is tell you about is what I had for dinner last night. This recipe comes by the way of my foodie friend Mo who gave me her version of Homemade KFC some time ago and it changed a lot of lives dinner times in my world ever since. Before I met hubby, I really wasn’t a hugely adventurous eater, but I hasten to add that I do not think Kentucky Fried Chicken is haute cuisine but you get my meaning. I had a sheltered palate. I had never been to KFC, was a tad suspicious even but Hungry Hubby told me, “if you like chicken, you have to try The Colonel”. And I did like chicken. As it was early days for us, I thought I’d try and impress him with my willingness to try new things so on we went. A very guilty pleasure was born! I recommend poaching bone-in chicken pieces in milk first as it makes them extra tender and gives you a chance to get an extra layer of seasoning into them. I promise you the extra work and mess it creates is worth it. Double dipping to get an extra crisp coating is highly recommended. You may find you need slightly more or less than the amounts stated but this isn’t an exact science. It will depend on both your preferences of the amount of coating and also how big the pieces or chicken breasts you use are to some extent. See how crisp it comes out despite using next to nothing extra oil? You have to give this a try and wow your friends and family alike! Honestly, it is remarkable how like the real deal this is but oh so much better to taste (and better for you) for not being saturated in fat. Eating is believing! I’ve won big brownie points for making Hungry Hubby his own Bargain Bucket to nibble on as he watches football, plays computer games with his friends and also for making Homemade Zinger Burgers on many an occasion since discovering this recipe. So here it comes, the not-so-secret blend of herbs and spices. You are so welcome! The secret blend of herbs and spices is not so secret anymore! Whisk ingredients together then store in an airtight jar until needed It should last as long as the minimum use by date on your ingredients. That's all there is to it! Make Your Own Bargain Bucket! Put your portions of chicken in a large saucepan with the bay leaf and a generous seasoning of salt and pepper then cover with milk. Bring to the boil then reduce to a simmer for 10-15 minutes until just cooked through. Drain well in a colander and then dry off with paper towels. In one shallow bowl place some plain flour to toss the chicken pieces in as their first coating. I use around 100g flour for 6-8 pieces of chicken but just go by eye. In a second shallow dish, beat 1-2 eggs then toss your flour coated chicken in this. In a third bowl, place about 100g (half a cup-ish) of the blend of flour, herbs and spices and if you fancy an extra crunchy coating, add a few tablespoons of fine cornmeal. I love to do it this way. If you want an extra thick coating, at this stage dip back into the eggs then into the coating one last time. Place on a greaseproof or foil lined baking tray and spray liberally with oil or dot with a small knob of butter per chicken portion. Bake in an oven preheated to 180°C for 25-30 minutes by which time the chicken will be piping hot through to the bone and the coating will have crisped up nicely. Turn once half way through cooking spraying with more oil or butter if liked. 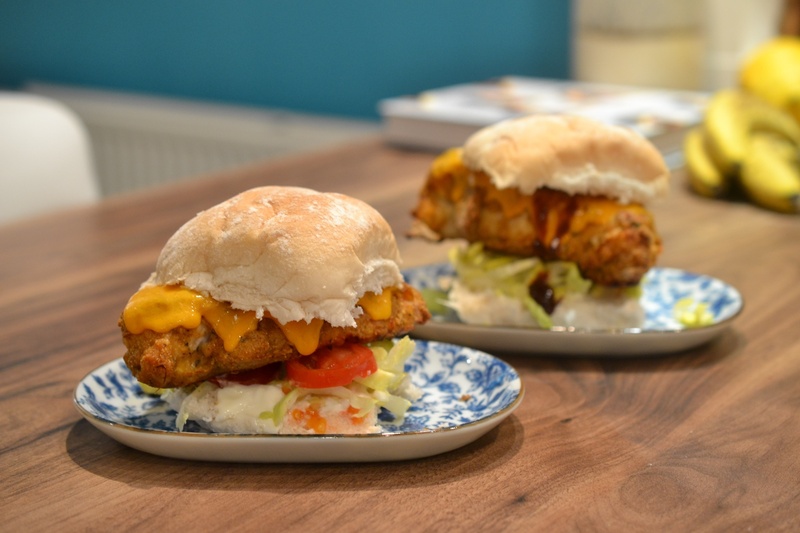 Make Your Own Zinger Burger! Mix about 1 tbsp seasoning per 100g plain flour to coat 4 chicken breasts. You may add up to 50g polenta if you want extra crunch. I also add an extra tsp of chilli powder to give them the "Zinger" vibe. After coating with the flour mixture first, dip the chicken in the beaten egg then for a second time, in the seasoned flour. Then either bake for 20-25 minutes at 180˚C or fry in a frying pan with a thin film of vegetable oil in for approximately 8-10 minutes turning once until cooked through and no pink remaining. I must admit to preferring to shallow fryl if making burgers as they have a lot less fat than the bone-in, skin on portions. Jodie, you really have made my day!! I am so pleased that you love this as much as I do!! I really do Mo – it made Neil so happy the day I secretly made him zinger tower burgers using your recipes – the only thing I didn’t make was the mayo! It’s brilliant that you can get the famous taste and texture without all the grease. Genius! No I resisted, but only for the fact that I didnt want to be sick with it after to turn me off this recipe!!! When I find decent chicken you can be sure that i will be making this!! Ah yes, I’d forgotten the Doha chooky wasn’t upto par! How sad for you MrsPP, Hungry Hubby would cry if he had to leave anywhere with no chicken! Great post, Jodie! Didn’t Maureen indeed let us in on a gpod thing with this recipe??! I used to also frequent KFC a bit as a kid – I particularly loved the Hot ‘n Spicy blend! But as I got older, I slowly turned away from fast food. Maureen’s blend is great, though I like to add a bit more salt. That’s interesting to know that you can also get good results from baking instead of frying – might have to try that one day! I just love the baking element too ELB – I would never, ever deep fry anything myself (after my churros experiment!) again yet with Mo’s recipe, me and hubs can enjoy the taste of our naughty little occasional indulgence more often, knowing exactly what went into it. I’ve still never been to a KFC, ever, despite a very lovely one being five mins from my house but you know the urge just isn’t there to go to a fast food take out joint. I mean why would I when i could turn out something as glorgious as what have in my own home. Stunning. Do you leave the skin on or off after poaching? Well each to their own Julia. Food for me is about everything in all it’s forms in balance with one another. Life is far too short for us to eat just one type of food, it’s just a case of evening things out elsewhere. Plus this post has had more hits so far today than any of my others so far so I know I’m not alone! Hi Jo, thanks for sharing! I can’t wait to try this recipe. I just have one quick question… when you describe the conveyor belt above you have seasoned flour, egg and then the polenta and secret blend mix… is that right? If so, what exactly is the flour seasoned with? Cheers! 5 Repeat and then deep fry it on a moderate heat until golden. This chicken tests like A famous burger chain’s Zimger Burger. Delicious, but I shouldn’t be looking at your blog…I’m still on diet! But these are soooo much better for you than going to visit the colonel himself 😉 mwuahahaha! wow, that is mega! I googled to find the Dan Lepard recipe again for someone and found this as first on Google. Great change on your Blog Jodie! And this is always a great recipe! Seriously? You have a jar of spice mix marked KFC spice blend and you made Zinger burgers?? May I say that I’m officially in love with you? It’s the most popular recipe on my blog Anna – I can;t recommend it enough! I know you will love this. Yesterday I road tested your secret herbs and spices blend on a rather huge batch of oven fried buttermilk chicken drumsticks to feed my son’s rowing eight. Devoured with gusto and voted so much better than KFC. As my son put it – all the flavour without the grease. Oh and I aded some polenta to my flour mix – it really amped up the crunch factor. Really enjoyed reading this blog Jo. Made this tonight and have to say it was really tasty. However……. personally I don’t think it tasted anything like kfc. Great spice mix though that I would certainly use again. I’ve had one person say that begire but regardless as you say, it tastes great! LOVE that you’ve posted a homemade KFC. Will definitely be trying this. Looks amazing. Thanks for the recipe i tried this and it turned out a bit too salty..! where did i go wrong, used exact amounts as stated above. thank you Jo, Will give this another try again, I may exclude the salt from the milk part too. I am so excited to try this! 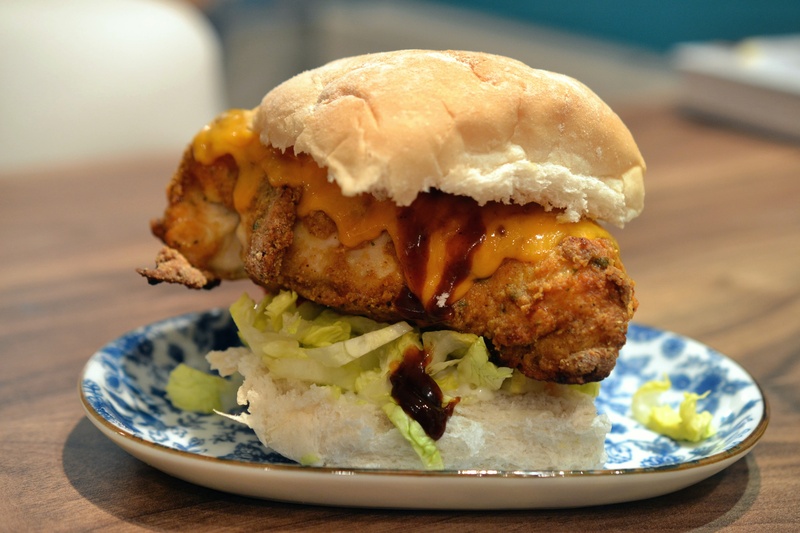 My MIL loves KFC, but I don’t love the fast food – this will be just terrific, I know we’ll both enjoy this! I don’t eat KFC, but this sure looks like something I would try at home. I love smoked paprika – curious to know why you have suggested not to use it? I use ordinary paprika as it’s a prominent flavour as it is – if you added smoked (which you can if you want to) I would reduce the quantity quite a lot, at least by half, or it will dominant all the other herbs and spices. I have several deliciously guilty secrets — so I can totally appreciate this one! The big question is — have you had Chik-Fil-A? That is chicken nirvana! This looks WAY better than KFC! I am pinning this for future reference. Homemade is always so much better because you can tweak it to make it healthier. I’m sure you’ve made a lot of KFC fans very happy! Now they can make their own at home any time they get that KFC craving! Just to say that I love this recipe & use it often! Thank you, Jo & Mo [♥] I read somewhere (it was on tinternet so must be true) that despite the ad catchphrase, real KFC does not contain “11 herbs and spices” but just flour, salt & pepper, so your version has far more flavour! Could you substitute cornflour for regular flour to make it gluten free? Nothing At All Like that KFC flavor.